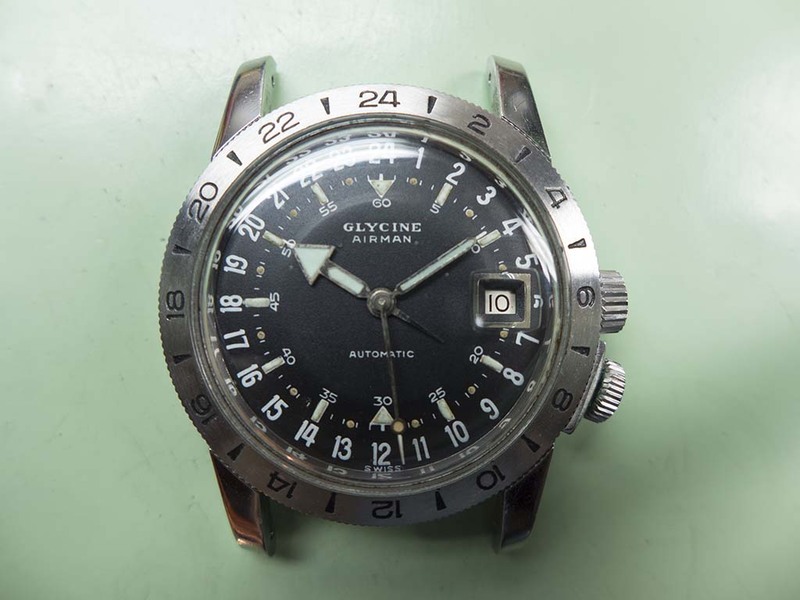 Glycines Airman model introduced in 1953 became the companies most well known watch. Glycines chief sales director Sam Glur, on a Thai Airways flight listened closely as the pilot he was flying with described his requirements of the ideal pilot’s watch. When Sam returned from his trip he mentioned his conversation to Glycines owner Charles Hertig Sr. and almost immediately development began, remarkably the whole process only took four months for the watch to be completed. It was rolled out in the American market first and was an instant hit, with its 24hr dial and unique hacking feature which stopped the seconds hand exactly on the 24hr marker. Early watches used the Felsa 692 calibre movements until 1960 when they were replaced by A. Schild movements. This particular example is a pre 1960 model and came in for a service and to sort a problem with the winding and handsetting. The owner also wanted the green lume changed on the hands for something less jarring.